Take a walk through the woods with this awesome compressor. 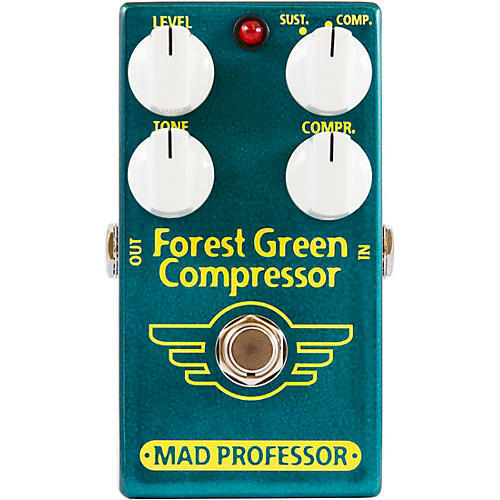 The Mad Professor Forest Green Compressor is designed to meet the highest standards of guitar and bass compression.There is extremely low noise throughout the range and a high overload margin, which allows also a wide dynamic input range at minimum distortion and noise. FGC is equipped with a special tone control to fine-tune the compressed sound for most transparent tone and effect. The pedal has a switchable compressor and sustainer mode. In Sustain mode, you can get a very dynamic, touch-sensitive tone with a long sustain. Here the attack is not lost, making the pedal suitable even for blues players and works great with slide playing. Level: In Compressor mode adjusts the overall volume and the FGC can be used even as a booster. In Sustain mode, the Level no longer adjusts total output but the level of the sustained part. Compr. : Sets the amount of compression and sustain. lower settings give mostly peak limiting, higher settings more compression and less touch sensitive response. at maximum the output will be heavily compressed, while still retaining clarity at almost infinite sustain. A good starting point for this control is a bit below center (ten o’clock) with most guitars. Compressor/Sustain Switch: Attack and decay times are carefully fine-tuned and internally set for swift attack and slow decay. Sustain/Compression switch set for Sustain the attack is preserved allowing dynamic touch and ease of playing as the FGC amplifies the decay and weaker parts. For standard compression set the mode switch to Compressor.